Chicanna Structure I sits on the western side of Chicanna’s Group A and is the only temple built in the distinctive Rio Bec style. 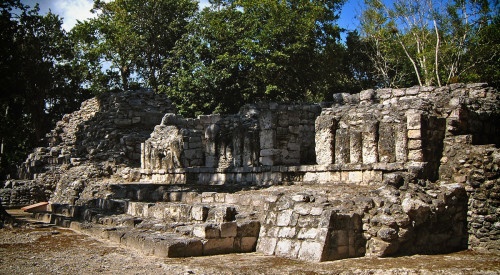 This curious and unique style of architecture is found in the area surrounding the Rio Bec (River Bec), where approximately 40 sites have been discovered, including Becan, Rio Bec, Xpuhil, and Chicanna. 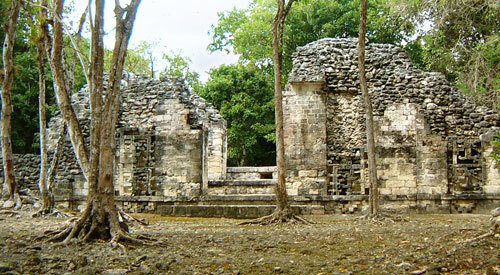 Rio Bec architecture proliferated during the Mid/Late Classic Maya Era. 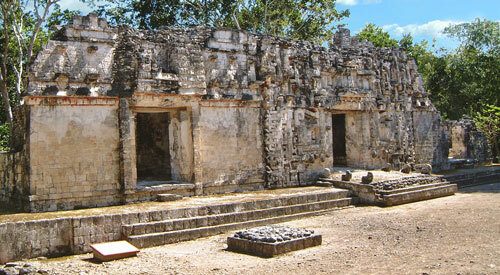 It is likely that Chicanna Structure I dates to 700AD-800AD, when both the style and the site were at their zenith. As was common with Rio Bec temples, Chicanna Structure I was constructed with finely cut stone embellished with ornate stucco and rests on a low platform with an unusual tower at either end (see fig X0673). 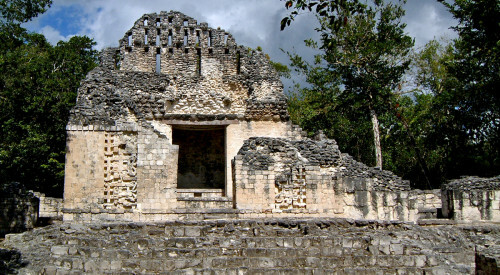 Chicanna Structure I features three front facing chambers, each with its own doorway around which the remnants of stucco images of the rain/storm god, Chac, are still visible. The exquisitely crafted temple is framed at either end with a small pyramid tower that originally had stairs running up the eastern face (only the lower four rows of steps remain on each tower). These stairs are thought to have been too steep to be functional and were also overlaid with stucco masks of Chac. On top of the towers, it looks as though temples once stood, but again they appear to be ornamental, with no inner chamber and only a niche or false door at the front. These curious ornamental pyramids are also typical of the Rio Bec style and are thought to be modelled on the towering pyramids of Tikal. Looking at Chicanna Structure I, it is possible to visualise the Rio Bec style as a combination of the Classic Era pyramid with the Late/Post Classic Chenes and Puuc styles. The Classic, Chenes and Puuc architecture achieved the same symbolic purpose – to represent a sacred cave – but they used very different methods to symbolise this sacred place of creation, whereas the Rio Bec style seems to be a combination of all three. 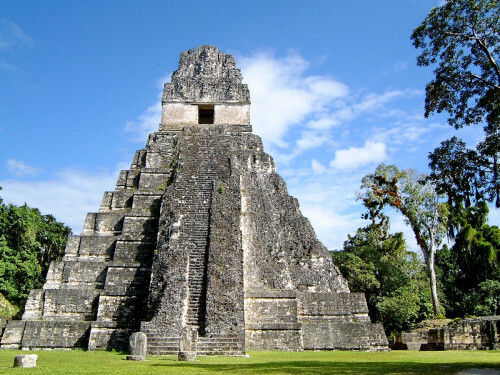 Classic Maya pyramids were constructed of a series of narrowing, tapered platforms with a temple on top. Occasionally, the number of levels used in the construction of the pyramidal base was symbolic. In particular, the use of nine levels was chosen to correspond with the deceased’s journey though the nine levels of the underworld, Xibalba. But even the most basic designs bore a fundamental symbolic purpose – they were symbolic of the earth or mountain. The temple on top of this symbolic mountain represented the sacred cave from which the first human being, the Maize God, appeared. It was the Temple that held the power – it was perceived to be a portal to the spirit world and a place were priests and rulers could contact powerful ancestors, supernatural beings and gods. The pyramid was an artistic device, designed to make the Temple appear more like a cave. However, the tall pyramids that rose above the jungle canopy also served as observatories and were used to measure the motion of the stars, moon and sun. Pyramids were sometimes placed strategically in pairs or groups, so that lines of sight were created or shafts of light could be seen travelling from one to another on special days of the year (in particular the winter solstice). It has long been recognised that the towers on Chicanna Structure I look like the towering pyramids of Tikal (such as Tikal Temple I, fig. W0845, which stands opposite Temple II), but Tikal features nine twin pyramid complexes that include shorter pyramids and a long, low level temple. This is very familiar to Chicanna Structure I and the Rio Bec style and seems to symbolise a deep, hitherto unknown, meaning. The Chenes and Puuc styles temples also represented the primordial cave, but instead of building a mountain they used intricate stone fretwork to create an image of the great cave monster (see fig. 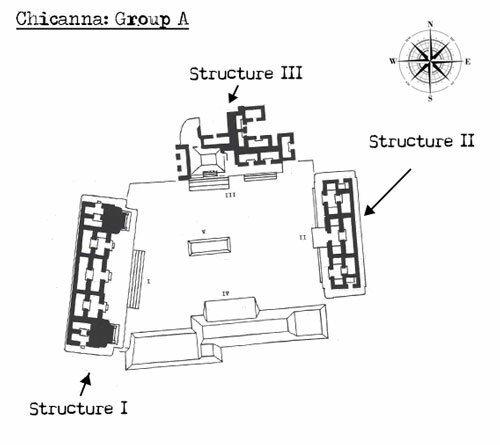 X0674 – Chicanna Structure II). This image was not new and had been used on carved altars and stelae since the Early Classic period (see the Zoomorphs of Quirigua and in particular Zoomorph B). 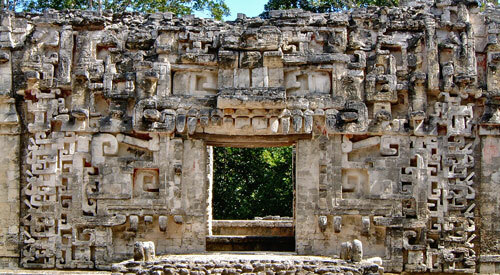 Rio Bec structures sometimes featured monster-mouth doorways, although Chicanna Structure I does not. 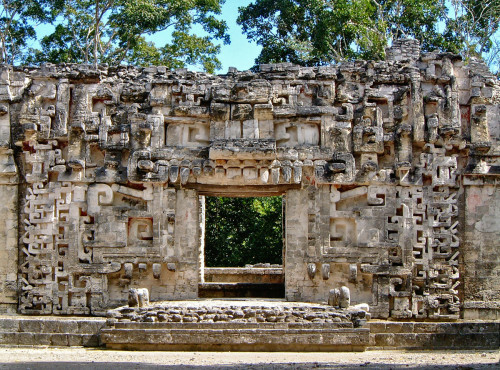 However, Chicanna Structure I does feature intricate stucco work around its doorways portraying the Rain God Chac, which is also very much in keeping with the Rio Bec style. Together, the Rio Bec, Chenes and Puuc styles all date from the Late Classic period and heavily feature the Rain God, Chac. The increasing need to pay tribute to Chac during this period could be an indication of a growing need for rain. Geological surveys have demonstrated that Mesoamerica was racked by drought over a prolonged period leading up to the collapse of the Classic Maya civilisation in the 10th century. Continued drought would mean fewer resources, such as man power and wood (required for moving stone and producing the swathes of stucco required for pyramids). This would explain the switch to smaller, functional structures, that offered both grandeur, functionality, symbolism and protection all in a single structure. 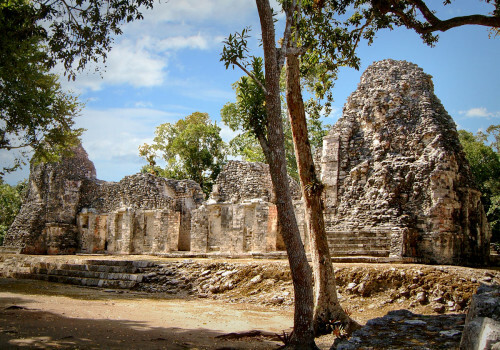 Chicanna Structure I: An Architectural Revolution? 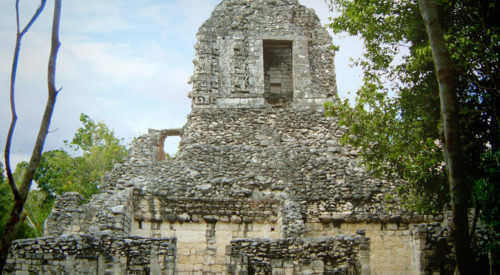 In Chicanna Structure I and the Rio Bec architectural style, we can see the beginnings of a move away from the monumental pyramid construction of the Classic Era. Chicanna Structure I is clearly a scaled down model of a Classic Era twin pyramid complex, with a proto Chenes and Puuc style temple straddled between. Far from being non-functional, the pyramid towers of Chicanna Structure I were an essential part of the temple’s symbolism and purpose. It is also likely that the pyramids of Chicanna Structure I were observational markers. Chicanna Structure I stands on the west side of the Group A quadrangle, so the sun would have set directly behind the towers on at least two days of the year – e.g. on the winter solstice the sun may have sank into the left tower and on the summer solstice the sun may have sunk behind the right hand tower. 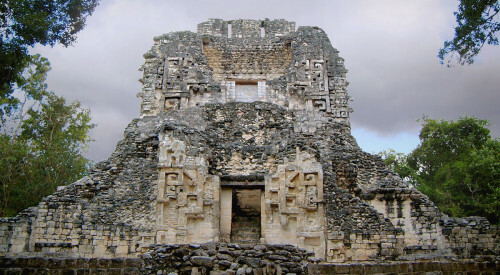 Creating solar effects was a common secondary function of Mayan buildings (and those of numerous other civilisations) and is termed as hierophany (a visual manifestation of something sacred or supernatural). There are several possible viewpoints within the Group A complex, with perhaps the most obvious being the monster-mouth doorway of Structure II on the opposing flank of Group A, where observations relating to the towers could have been witnessed. There are also the remains of several low platforms around the plaza of Group A and the low structure that runs along the southern flank of the group could also have been used for sightings. Whether the shift to a scaled down model of the Classic Era pyramid complex was brought about by depleted resources, a religious shift or the revolutionary whim of the commissioning ruler we will probably never know. Whether the Rio Bec style and Chicanna Structure I was part of an evolution from Classic Era pyramid structures to Chenes and Puuc low-level temples is also hard to prove. However, it does appear fairly certain that culture and style shifted north towards the end of the Classic Era and that Chicanna Structure I and the Rio Bec style were part of a revolutionary new idea, where form and flair would replace size and expense.